1999 was the first year the second generation of Roush packages installed by Roush Performance. The Stage 1 and Stage 2 packages were offered, each with side exhaust 150mph speedometer on a fully optioned Mustang GT. Stage 2 included performance suspension upgrades. A Stage 3 package offered engine performance upgrades. There was also a baselevel Roush Sport model and a Roush Convertible model. Electric Green 1999 Roush Stage 2 Mustang coupe, with Roush wheels, Roush side body panels with side exhaust, custom rear spoiler, and a 4.6L V8 engine. Chrome Yellow 1999 Roush Stage 2, supercharged 35th Anniversary, Mustang convertible. This was the first year of the officially modified Roush Mustang. 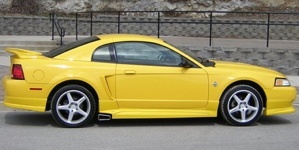 Only two Chrome Yellow Mustangs were modified in 1999 and the Roush Stage 3 was not yet available. Upgrades include Roush stage 2 valved shocks, performance springs, lower control arms, front sway bars, pinion snubber, side exhaust, front rear window decals, fender decklid badges, embroidered floor mats, cold air induction, rear 18x10 custom Roush wheels, and front 18x9 custom Roush wheels. This is the 1999 Roush Mustang sales brochure featuring the Roush Sport, Roush Stage 1, Stage 2, Convertible. and Roush Cobra, Options for the 1999 Roush V6, GT, and Cobra are described and shown.